Preheat broiler (a toaster oven may be used instead of broiler), placing the oven rack as close to the broiler as possible. To assemble, use a pastry brush or small knife to spread a small amount of pesto on one side of each baguette slice. Then place one half of a boconicini cut-side down on top of the pesto. 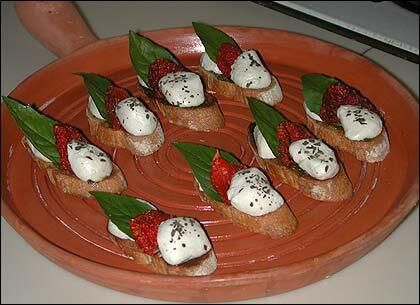 Next, place a basil leaf on top of the boconcini, followed by a dried tomato half  so that it's "standing up." Finally, place the other half of the boconcini on top of the tomato and sprinkle with dried oregano. Also see our how-to article on Drying Tomatoes in our Primers & Projects section. This segment appears in show #2719.